The acclaimed Kearsney College Choir from Botha’s Hill in KwaZulu-Natal has won two gold medals and one silver at the 10th World Choir Games. Under the direction of Marshell Lombard, the choir competed in three categories, winning golds in the Scenic Pop and Music of Spirit and Faith categories, as well as silver in the Scenic Folklore category. Known as the ‘Olympics for Choirs’, over 300 choirs and 16,000 participants from 62 countries are competing at this year’s Games, which ended in Tshwane on July 14, 2018. The world’s largest competition for non-professional choirs is held every second year, and this is the first time the Games have been held in Africa. There are two competitive sections: Champions (highest level of the competition for choirs which have already proven their proficiency at international level) and Open (choirs with no international experience). Within each of these there are 27 categories. Kearsney College performed in three categories of the tough Champions section, winning their two golds and one silver. After the announcement, Kearsney headmaster Elwyn van den Aardweg said he was extremely proud of the boys’ achievements. The choir has now achieved 15 gold medals and seven silvers at the World Choir Games since 2000. Its recent successes on the international stage also include two gold medals at last year’s 10th Orientale Concentus International Choral Festival in Singapore; the Prize of the City of Vienna at the 33rd International Youth and Music Festival; and an invitation to represent Africa at the Rhythms of One World Music Festival at the United Nations’ European Headquarters in Geneva. 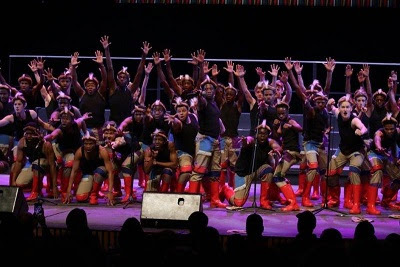 Last week, the choir received standing ovations following its four performances at the Grahamstown Arts Festival ahead of the World Choir Games. The Kearsney choir has a growing international following, with supporters in America, Asia, Europe and the rest of Africa; and has been hailed as a great showpiece of the Rainbow Nation. It’s not the traditional ‘school choir’, but an amazingly vibrant group of boys who perform their signature blend of classical, pop and indigenous music, he said. The choir will perform two supper theatre shows at Kearsney College on July 19 and 20. Food and drinks will be on sale, but those attending are also welcome to take their own refreshments. The shows start at 19h00 with doors opening at 18h00. Bookings are through Computicket.